Born October 8 in Jodhpur, India, JJ Valaya, one of India’s most celebrated designers, has come a long way from his days of auditing banks in India. Growing up in an Army family, JJ and his two older brothers were raised by their parents in various cities across India. His creative sensibilities were apparent at an early age when he would unabashedly fill the last pages of his schoolbooks with sketches and doodles and remained the best artist and calligraphist in his school for five years in a row. Despite the common notion that he attended fashion school as his foremost chosen career, he actually did his Bachelors in Commerce at a Chandigarh College followed by an 18-month stint in Chartered Accountancy, and finally dropped out to pursue fashion. 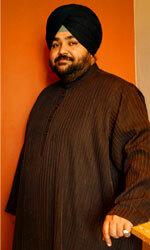 In 1989, he enrolled himself in the National Institute of Fashion Technology (NIFT) n Delhi. He graduated two years later after winning various awards which included The Prix de Incitation in Paris, The Thapar-Dupont Medal, The Elyxa award and the KLM-NIFT Trophy. Upon graduation from design school in 1991, he chose to follow his own dreams, a decision taken by the flip of a coin. Along with his older brother, TJ Singh, he then launched his first label- ‘JJ Valaya’ in 1992 as a couture line (perhaps because of the grandeur, style and intrigue that the brand is now associated with). Next came his home collection, ‘Valaya Home’ followed by his line of Diffusion clothing- ‘Studio Valaya’ in 1999. The JJ Valaya label is best known for its signature bridal trousseaus and exclusive eveningwear for discerning women and men. Whereas the JJ Valaya Couture collection continues to define the trends for the season, the Studio Valaya line evolves the same trends into a watered down, cleaner and more affordable younger look. Valaya’s originality and his brother’s entrepreneurial abilities have made the House of Valaya a pioneer in the Indian fashion Industry. His style ignores gimmicks and chooses instead to innovate on a quality that defines elegance - timelessness; a quality that conveys permanence in a world infatuated with the temporary. His roots remain attached to the past yet he intriguingly infuses it with the madness of the new. His larger than life shows reflect this philosophy and have been instrumental in revolutionizing the scale of single designer shows in the country. He has several successful solo fashion shows in New York, London, Paris, Dubai, Singapore, Hong Kong, Johannesburg as well as in most major Indian cities to his credit. He is a founder member on the Board of Governors of the Fashion Design Council of India (FDCI) and the Official Brand Ambassador for Swarovski, India. He lives in Delhi with his wife and daughter. The House of Valaya, today considered as one of India’s most respected fashion houses, was born in 1992 with a workforce of 3 persons working out of a 150 sq. ft. room. Today the group employs more than 250 persons and works out of its 40,000 sq. ft. facility in Gurgaon.